Reading a few articles here and there on this forum about WES7, I decided to give it a try and compare it to my loyal WinPE 3.0. So I downloaded it, burned the iso and stuffed the dvd in my lenovo t60 (where windows 7 pro was already installed) and booted from my dvd. (you have a 180 days evaluation version here : http://www.microsoft...s.aspx?id=11887). 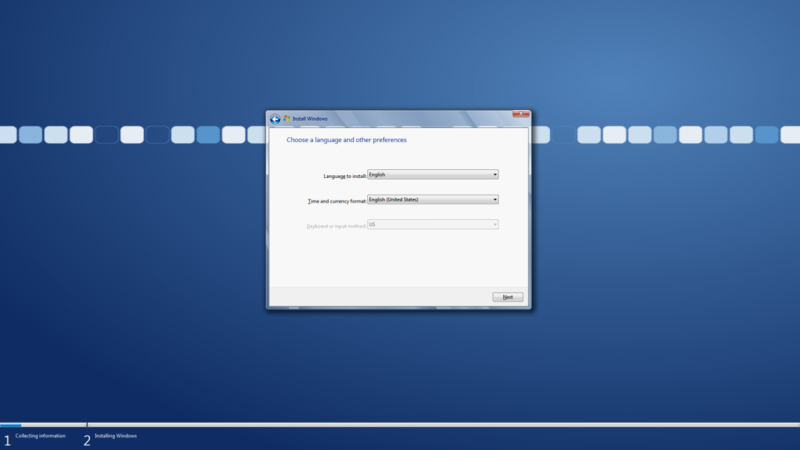 Since I did not want to mess up my already installed windows, I decided to install it to a vhd file. Note that some of the above command might be useless (like the bootsect, I am not sure if the setup actually handles the bootsect). Also note that the setup takes care of editing the BCD and adding a new entry pointing to my new WES7 on VHD. Within 15 mns I was able to install and boot from my fresh installed WES7. Disk footprint was less than 1 GB and memory footprint is 300mbytes once logged on. OS is full operational (network, IE8, media player, etc) and looks perfect for small hardware configuration and/or for small usage (remote desktop client, setop box, etc). Very interesting experience! I installed WES7 already preconfigured by someone with plenty of multi-OS config experience, so it can do some extra things, but weights 3Gb after install. Didn't expect it to weight 1 Gb though... Not sure, what Application Compatibility Mode allows to do feature wise? I assume you booted WES7 natively from VHD placed on your HD, or via Grub4DOS? Did you already try all features of the Configuration Toolkit that comes with it as a separate DVD? As to Bootsect command, it makes sense when booting unsupported for native boot Win version from VHD with G4D, since Bootmgr inside the VHD will read MBR & PBR in this case, despite it goes straight to winload.exe, when OS on VHD is booted natively from Windows Boot Menu. There are some other situations when Bootsect command is invaluable, like restoring a broken bootsector. Some experience is required to use this command with offline VHDs, it doesn't always work as one would expect, but any such issues are always correctable with EasyBCD and Visual BCD Editor. 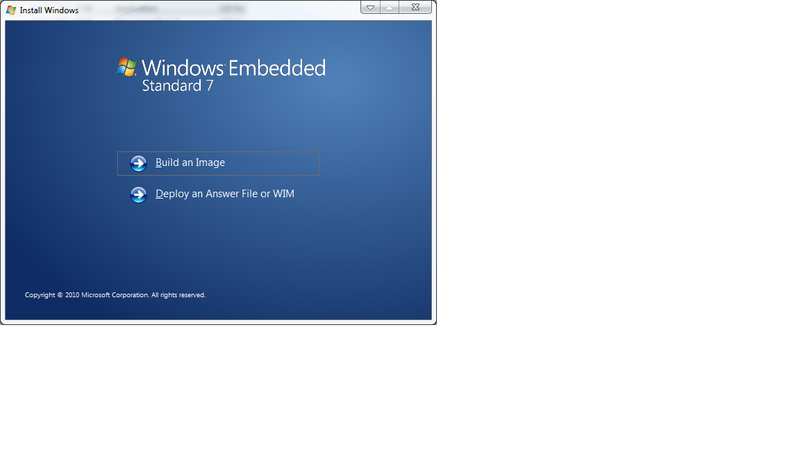 I installed WES7 in native vhd boot. I did not use grub4dos here. I did not play yet much with WES7 : one thing I really would like to achieve is a portable distribution (WIM file?) I could use on several hardware. I am going to navigate thru all the options now. Still I really much enjoy the easyness of this installation : "next...next... you are done!" . Right now it looks pretty much as a light windows with pros (light, fast, etc) and cons (has to perform installation, specific to one hardware, etc). Regarding bootsect, reading you, I feel indeed that command was useless in my scenario testings. Side question and not fully related to this post but do you know if WinTPC supports native VHD booting? Also thinking loud, since the disk footprint is so light (a 1gb VHD file is big enought), it should be easy to load it into ram with grub4dos as well as mentionned by sambul61 in this thread : http://reboot.pro/15685/ . Was .Net (version?) installed with this WES7 option you've chosen? ThinPC7 appears not configured to support native boot from VHD by default, unless this feature is activated after install (with activation method being searched for). But it can boot from VHD via Grub4DOS & WinVBlock for now (see Install Unsupported OS to VHD Tut). Also try applying WES7 to VHD using alternative method from Step 4 of that Tutorial. After that you can distribute the VHD (before 1st reboot) to many PCs, and reboot on each to specialize to its hardware. Remember, WES7 activation Key can be entered only during 1st reboot, and can't be changed later (instead you just 1st reboot another fresh VHD copy ). But you can change the key in ThinPC any time. You can shrink (copy) your VHD with VHD Resizer and some other tools at present. Some free space must be left on it though for OS metafiles, despite Pagefile may be redirected to a different drive or suppressed (will attempt to create a Temp Pagefile regardless). However, there may be very few advantages of loading OS into RAM, especially if it boots from an external USB drive aiming to service an internal PC drive. Of course, if you boot the VHD from the same volume of the internal drive that you service, it makes sense to boot it into RAM. Further shrinking & customization can be achieved with WES7 Configuration Toolkit. 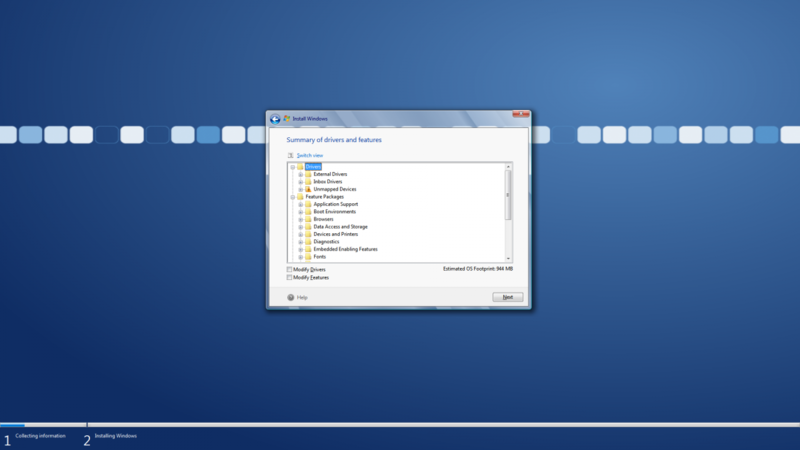 I believe this is per default (like standard windows 7). I am going to give a try to thinpc7 shortly (just completed the iso download). Can you point me to the right direction on how to active this feature afterwards? I have seen your tut indeed : looks great and I was actually planning on running thru it already with thinpc7. I think I am going to drop the load to ram via grub4dos : indeed there is little interest over native boot. Again, there might be no advantages of loading OS into RAM, when VHD boots from an external USB drive aiming to service an internal laptop drive. But, if you boot the VHD from the same volume of the internal drive to perform its service, it makes sense to boot it into RAM just like WinPE. I prefer to boot from an external 2.5" laptop drive in SATA & USB Enclosure for servicing PCs, but if you want to boot from a USB Flash, consider installing & configuring EWF filter driver (or similar) and redirecting Pagefile to another drive to avoid writing temp files to the flash memory, as its known to slow down any OS. As to enabling native ThinPC boot from VHD, the method isn't found yet, though it seems feasible, as all required drivers and services are present after install. I'd suggest to bypass this issue for now, but if you're really curious and want to help it resolved, read this and that Sha0 and others explanations, and then try adding reg values from this cdob's post to ThinPC Registry keys, if not there yet. Better, try comparing Registries of the 2 WES7 mods (App Compatibility and ThinPC) to find relevant differences, which is not easy, since there might be other keys and settings involved. Of course, the best way would be to activate this feature in ThinPC with Image Builder Wizard or Config Editor included in the Config Toolkit, but the docs keep silence "how". Web sources say, System Services - File System - Advanced File System component must be added to the image using IBW. Good luck with this quiz. Talk to you tomorrow. 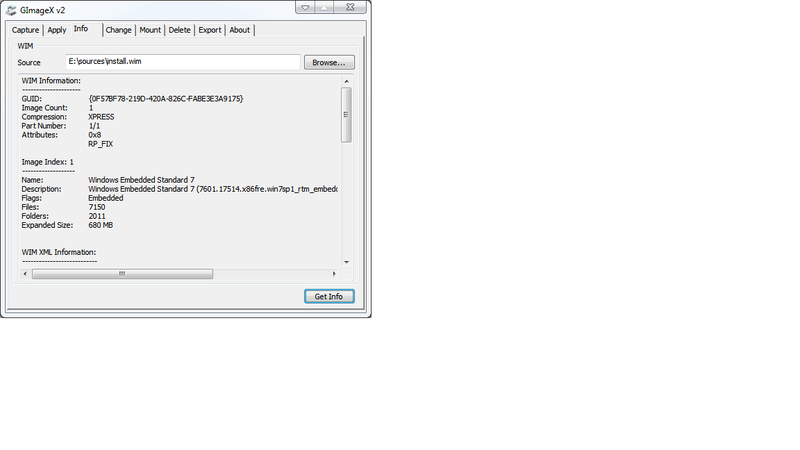 Side note for later : resizing down vhd file does not seem possible (at least with the tools I have so far). Loading from memory has also one obvious constraint : the bigger the file, the more memory you need (hence it is important for me to resize dowb my 2gb vhd file). Also, question for later : is there a way to lock down the vhd file? by that I mean I would like all datas changed during the session to be wipped out (so that I dont have to install some EWF filter). Would difference VHD disks be the solution? I need to investigate there. In parallel I am trying to install ThinPC to a vhd file but loading directly from file also has anotger big con : file must be contiguous. I just looked back for a minute from another thing I'm doing, and will try to answer this. Try to attach the VHD, mount its volume and defrag as a regular hard disk with such tool as PerfectDisk (that offers Boot Time Defrag to move system files & MFT, which may work without reboot on offline disks) before shrinking it. Yes, moving locked files on NTFS Volumes may be a problem. If not, you can reapply WES7 from ISO to a smaller VHD in 3 min. If OS installed on VHD is supported for native boot, you can create and boot a differencing VHD, while marking its Base VHD Read Only in its file Properties. No need for any extra filters like EWF, unless installed by default. But still OS continuously storing temp files on Flash will slow down any OS without EWF. G4D can't boot Dif and Dynamic VHDs now, only fixed. To make a fixed VHD contiguous, detach it and run WinContig on the VHD file. If G4D still complains after that, defrag that VHD file with PerfectDisk (it has File Defrag feature) or similar advanced defragger, or defrag the whole drive where the VHD file is stored. Apparently, ThinPC also boots natively from VHD by default, no WinVBlock driver needed, all required features are already added. The problem occured, because FBWF and ERF are included in ThinPC, and a bug in FBWF prevents native boot from VHD. After that ThinPC booted natively from VHD without a glitch. Of course, its not optimal solution when booting from a flash (so you need to install WinVBlock to ThinPC VHD in this case and boot it via G4D), but fully acceptable when booting ThinPC VHD from a hard drive. How big is a ThinPC install? @medevil : install in progress (struggling with 0x7b bsod) but I had to size my vhd at least to 4gb to start the install. Whereas a 2gb file was plenty enough for WES7 (disk footprint=1gb once installed). 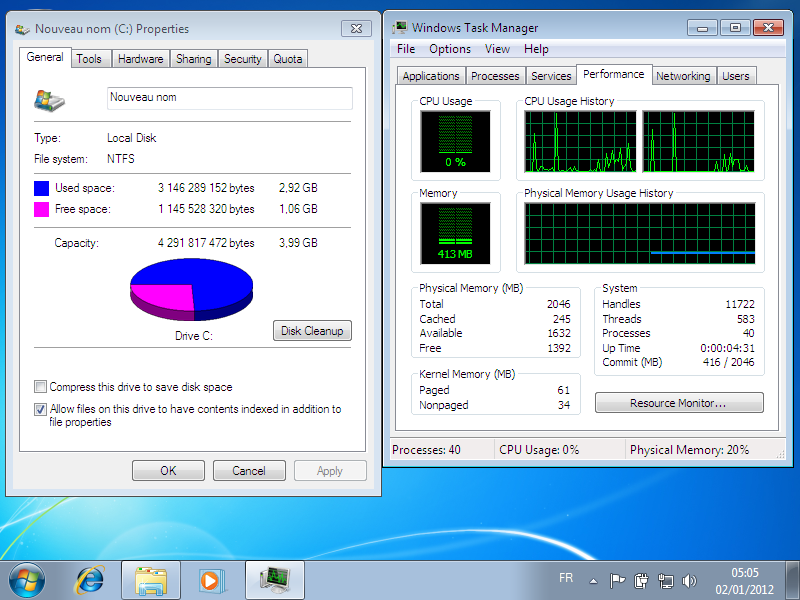 See attached screenshot : installation takes a bit less than 3gb and memory foot print is around 400mb. -need to check if tools like winntsetup or nt6.x installer can handle WES7 and ThinPC. -this still looks hardware specific : I need to try if I can use my vhd on different hardware platforms (not too sure about this). -the welcome screen dysplays "thinpc" but when checking the computer information, it displays "windows embedded standard". does it mean "thincpc" is a "rich" WES7? You can try to specialize ThinPC VHD ( meaning 1st reboot) on any PC (attach it first and add its boot entry to that PC's Windows Boot Menu), since OS is applied offline with ImageX to the attached VHD disk. WES7 can also boot natively from a USB drive. To boot it both inside a VM like Windows Vitual PC and on real hardware, do the 1st reboot inside the VM, then add offline your real hardware critical boot drivers to ThinPC VHD, following wimb's IMG-XP tool instructions (or apply relevant Registry Tweaks from unpacked IMG_XP's POST_INSTALL folder) or similar method. Don't forget to set DetectHAL ON in ThinPC BCD entries. Screenshot from gimagex on ThinPC wim file. Screenshot from gimagex on WES7 wim file. I wonder, what would be the installed OS size, if you select Minimum Configuration, when building WES7 Install.wim in IBW - is it 680Mb? Did you want to try WES7 Compact? The spec says, its min install size is 500Kb, but don't count on it, when running from a PC... It still can be installed in ThinClient config though. About WES7 min size, I would not be surprised to trim it down to 680mb when installing the most basic template. The template I picked up (IE+Media Player+RDP) is only 990 MB. I dont know WES7 Compact : is this another iso? From a user experience, the thinpc is really ideal : it really feels like a standard windows 7. Nothing is missing there as first look while keeping a light memory and disk footprint. From an IT point of view, rolling out distributions everyday, the WES7 is nice for its diskfoot print (less than a gig) and also because it does the minimum and many features have been stripped off (in my setup) : no compyter mgmt, no task manager, no cmd prompt, no run menu, etc. I compare it to XPe which I have been playing with in the past. I could also nicely fit I guess on a thin device (wise, hp-former neoware, etc). WES7 Compact eval can be downloaded from here, its also regularly updated. While WES7 Standard works natively with applications developed for Win7 & XP, its cousin WES7 Compact may require generic apps adaptations to run inside it. Not sure, if WES7 Compact's ThinClient Mode can run non-modded Win7 apps natively, but its footprint is minimal - need to try. I also found WES7 Standard modes for PC to be ideal OS to run natively from VHD from a small footprint like a Flash Card or Thumb, or a multiboot hard drive, while being fully compatible with all Windows apps without any scripts. I used it for PC service, and to test things inside Virtual PC or VMWare, and also trial running as main OS on old laptops. With a suitable customization it can perform all WinPE tasks, with main advantages been native fast boot from VHD, small size and full Windows apps compatibility. It can boot directly from HD as Filedisk, or boot from RAMDisk via Grub4DOS. Did you try yet to specialize WES7 Standard VHD on different PCs? Or run it both inside a Virtual PC and on real hardware? Tried booting from a USB Thumb? From RAM? Isn't Compact the new name of Windows CE? If so it won't run on intel hardware nor will PC programs run on it. "On February 9, 2011, Microsoft announced Windows Thin PC, a branded derivative of Windows Embedded Standard 7 with Service Pack 1, designed as a lightweight version used only in thin client scenarios. It succeeded Windows Fundamentals for Legacy PCs, which was based on Windows XP Embedded"
Thincpc is indeed built upon windows embedded. MS present proposes this as a thin client. To me it looks more as a light windows 7 like windows 7 starter edition. WES7 looks more as the ideal thin client. I did not play yet with WES (but it is planned). -wes7 gives me a "bootmgr missing"
I suggest to test those in Windows Virtual PC (this is a new reworked version) instead of Virtual PC 2007. The challenge though is to run the same image 1st inside the VM, then run it on real HW. You might need to add some drivers to critical device database to boot. 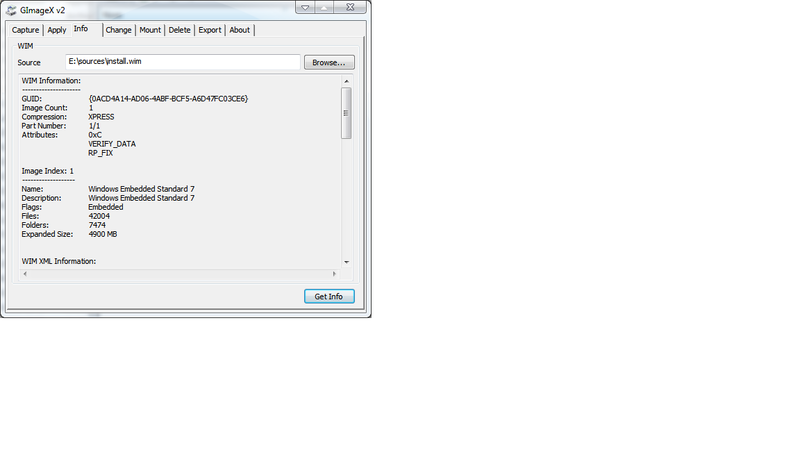 The error "Bootmgr missing" may require repair Bootsect & BCD, which is easy to do with EasyBCD, or manually with BCDEdit. from real hw to virtual is rather easy indeed (p2v) : you "only" need the proper disk driver basically. the other way around is indeed another story (v2p). ThinPC starts loading and BSOD's with a 0x7b : anything I forgot? edit : rebooting ThinPC via native vhd boot, I can see windows detects a new driver (winvblock) but fails to load it with no further explanations. edit2 : another reboot and this time the driver installed fine and I can now see a device named "winvblock driver" in device management.